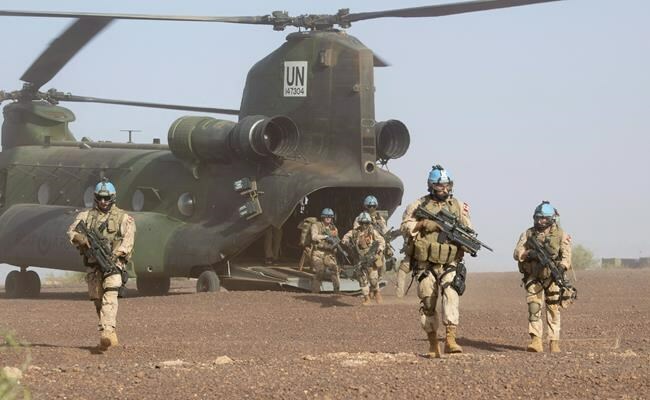 OTTAWA — Canadian peacekeepers saw their busiest day in Mali on Sunday after extremists with links to al-Qaida attacked a United Nations base, killing 10 and injuring dozens more. "Our deployed contingent worked professionally through an extremely complex and demanding day, supporting one another and those who were the target of this horrible act of violence." The operation was by far the largest that the Canadians have performed since arriving last summer in northern Mali, where their primary task is to provide medical evacuations to ill and injured UN peacekeepers and officials. The number of helicopters involved underscored the seriousness of the assault as only one Chinook is required to be on round-the-clock standby. Canada has three Chinooks and five Griffons based with the UN in Gao. Over the previous five months, Canadian peacekeepers had conducted a total of five evacuations involving six patients. Most of the rest of their time has been spent training and ferrying supplies and personnel to different parts of the country. Sunday's attack was the deadliest in months for the UN anywhere in the world. Those killed all came from Chad, bringing the total number of blue-helmets killed in Mali since 2013 to 187. Most of the dead have been from Africa. At least 25 more peacekeepers were injured during the attack on the UN base at Aguelhoc, responsibility for which was claimed by an Islamic extremist organization that allies itself with al-Qaida, Nusrat al-Islam wal Muslimeen. It's about 400 kilometres from where the Canadian helicopters are kept. The UN says the attackers arrived by vehicle at the camp and that peacekeepers "responded robustly and a number of assailants were killed." It says it is investigating to hold the perpetrators accountable. The attack has been condemned by Canada, the UN and other countries, and comes amid concerns about an influx of Islamic jihadists into Mali, which has been gripped by violence and instability since 2012. The jihadists have been blamed for stoking rivalries and divisions among different ethnic communities in the country, where tensions have been high as a result of drought, poverty and corruption. There are fears that Islamic extremists and criminal organizations will run wild there and across the Sahel, the wide expanse of Africa south of the Sahara Desert, if they are not dealt with in Mali. The attack on Aguelhoc, which is in the far north of the country, near the border of Algeria, was nonetheless unusual as most of the violence in Mali has shifted over the past year to the centre and south. Note to readers: This is a corrected story. It corrects the number and type of Canadian helicopters involved.